Lonely traveler reaches the ancient temple of the earth and discovers that it has been corrupted by unknown force. Will the magic he wields be enough to defeat them? 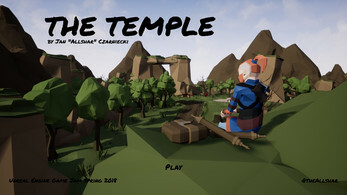 Game created by a single developer, for the UE4 Spring Jam. Left Mouse Button - Hold to charge attacks. Release to throw. You can throw existing rocks by dragging from them, or spawn new one when there are no rock nearby. Right Mouse Button - Moves existing rocks and spawns new ones. Shift - Quick shield block.